Because of family commitments and a wish to actually be allowed time to drive my own cars properly, for the first time in nearly 10 years I HAVE!!! to respect the cut off for September Renotes. There will not be…and cannot be any extensions. Whatever I have will be what you get. With all the shows we do and all I see on Facebook there will be no problem filling the magazine as I know all your submissions are on the way. Please make sure I have everything you have by the 1st of August. Good news is, if all goes to plan December is covered, we realise that we need to cover 1 magazine ourselves as there is clearly a limit to members contributions. 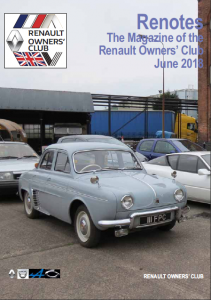 We are also looking for people to write advisories on how it’s actually quite safe to take your Renault out and attend shows…neighbouring cars will not infect you with rust.